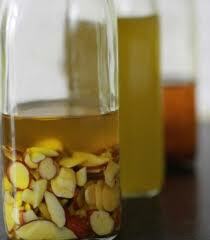 This oil can also be mixed with a little lemon juice or aged sherry vinegar to make a quick vinaigrette. It would go well with any kale salad too. Combine the ingredients in a small saucepan and cook over low heat, stirring occasionally, until the almonds are an even golden brown. Allow the mixture to cook to room temperature and store it in the fridge, tightly covered. The oil will congeal, so remove it from the fridge 20 minutes before you intend to use it. Will keep up to 2 weeks.